Antique music boxes – my first encounter with them was at the Orgel Museum in Otaru, Hokkaido when most tourists were being ushered into the main building with modern musical boxes and souvenir items, I made my way into another building a few doors away and discovered a wonderful collection of antique music boxes! Imagine my delight when I heard that a music box museum would be opening here in Singapore! The Singapore Musical Box Museum is the first of its kind in Singapore and stemmed from a promise that Japanese collector Naoto Orui made to his mentor, Graham Webb, more than 30 years ago, to bring a musical box that was made in Singapore in the late 1800s back to its homeland. More details on this locally made music box can be found further down in this post. Orui-san has moved part of his musical box collection from his museum in Nagoya to Singapore and this gentleman has a passionate interest to educate Singaporeans on how music boxes played a part in our country’s history before it gained independence. The museum is housed within the Chong Wen Ge building, next to the Thian Hock Keng Temple in Telok Ayer Street. I was fortunate to have Orui-san take me on a tour of the exhibits and soon discovered the many wonderful stories behind each of the musical boxes. Did you know that clocks and music boxes are closely related? (think of grandfather clocks and those clocks which chime to tell the time) There are many similarities between a clock’s mechanism and a music box – if you remove the alarm component in the clock, it is actually somewhat like a music box as it plays a tune. In addition, the wood used for making musical boxes is important as it helps to bring out the sound. There were several different categories of musical boxes on display and the first section that I was introduced to were the Cylinder Musical Boxes. This cylinder musical box dates back to 1878 and was made in Italy, with its movement being made in Switzerland. Cylinder music boxes are typically made of metal and powered by a spring. If you take a closer look at the cylinder, you can see raised pins on its surface and these help to produce the melodious tunes in the music box by displacing the tuned teeth/”reeds” of a flat piece of metal called a comb. The tines of the comb will “ring” or produce a sound, as they slip off the pins. The one below is the Mandoline Tremolo Zither, a cylinder music box made in Switzerland in the 1880s. This next one 6 Airs, made in Switzerland in 1875, is quite small in size as compared to most of the other cylinder musical boxes that we’ve seen but surprisingly has a crisp and loud voice! The next section showcases the Disc Musical Boxes. I was told that these are cheaper to produce as all that needed to be done was to punch holes into the metal discs and this also meant that they could be mass produced! The tune is punched out on the disc with the pitch being determined by the position of the punching. Did you know that these disc musical boxes were in existence before the invention of the phonograph and vinyl record players? Sublime Harmony Piccolo, made in Germany around 1890. As mentioned earlier on, one of the reasons behind the opening of this museum is this particular music box which was made in Singapore in the late 1800s. At the age of 29, Orui-san started learning how to repair and restore music boxes from his mentor, Mr. Graham Webb. During this period of training, he was shown five musical boxes which were made in Singapore but most of them have since gone to various collectors and this is the remaining one which Orui-san promised Webb to bring back to Singapore some day. Unfortunately at the time of my visit, this music box was still awaiting restoration by UK specialist James Preddy (also formerly a student of Webb) and hopefully he can help to bring it back to working condition as it will definitely be exciting to hear what tunes this music box can produce!! If you are wondering why the sign mentions China, Orui-san had done some research and found that in the days of Singapore’s colonial past, the British had taught Singapore craftsmen how to repair watches and clocks. Subsequently, when musical boxes were brought into the country, as the mechanisms for both clocks and music boxes are similar, these same craftsmen would also repair and maintain musical boxes and eventually they even started making musical boxes themselves. In those days, any goods manufactured in the East would be considered as “Made in China” or “Made in India”, thus if you found a “Chinese musical box” being sold in Europe, there was a possibility that it was a music box that was made in Singapore! Orui-san also mentioned that he felt Singapore was technologically very advanced in the late 19th century and was even ahead of Japan at that point of time! Wow…I learnt something new!! Over time, the musical boxes evolved and became more versatile and melodious, with some even incorporating other musical instruments (e.g. bells, drum, triangle, castanet, organ, etc…) into one big “music box” and some coin-operated ones were also built! Now for my favourite musical box in the entire collection…. The Atlantic, dated 1902 was initially supposed to go on the Titanic but they wanted a bigger one and so this music box went onto the Atlantic instead. If we take a closer look at it, this automatic musical instrument also contains Piano, Mandolin, Bass Drum, Snare Drum, Cymbals and even a Triangle! This is actually a coin-operated musical box and there is a slot on the left of it where you can drop in the coin. I guess this one probably earned quite a bit of money in its heyday as it required gold coins to be deposited before the mechanisms are activated to play a tune! For the purpose of demonstration in the museum, the mechanism has since been tweaked to accept one-penny coins. The one on the extreme left of the picture below is also a coin-operated box but it is somewhat like a jukebox and you can select a tune of your choice to be played. I had a listen of “Ave Maria” as this particular tune out of the rest was in its best condition (don’t forget these are antique music boxes so some items may have deteriorated over time). I enjoyed listening to this and got to see the mechanisms at work too! Finally, the last one that I’m featuring in this post is this Orchestral Musical Box, a cylinder musical box made in Switzerland around 1890. If we look at its components, we can see other instruments like a drum with 8 sticks, 6 bells, a castanet and a double reed 26 notes organ! This music box can play 8 tunes. Fans of Alicia Keys may find this music box familiar as it appeared in her “No One” music video. Watch the MV and you can’t possibly miss it! Overall, it definitely was an educational visit for me and I learnt a fair bit about the music boxes and part of Singapore’s history. Many thanks to Orui-san for the tour of the museum and Yoshie Osawa for helping to arrange the visit! Hourly tours are available from 10:30 to 17:30. Getting There by MRT: About a 5-min walk from Tanjong Pagar station, exit G.
A look at the entrance/exit doorway from the inside of the compound. Another look at the side of the building which houses the museum. There is also a fascinating pagoda in the compound, which you can admire during your visit to the museum. 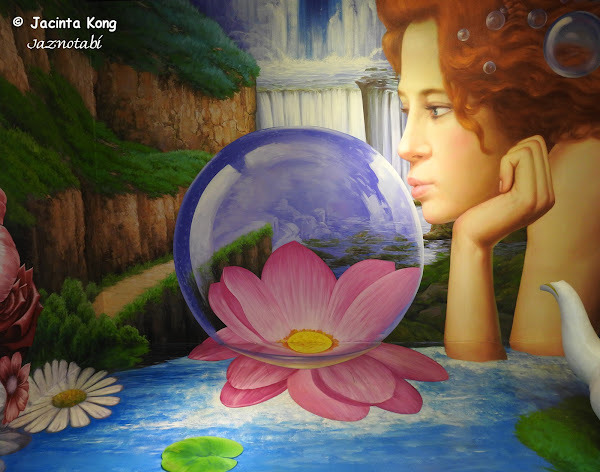 Alive Museum is the second 3D art museum which hails from Korea and opened in Singapore in June 2014, i.e. 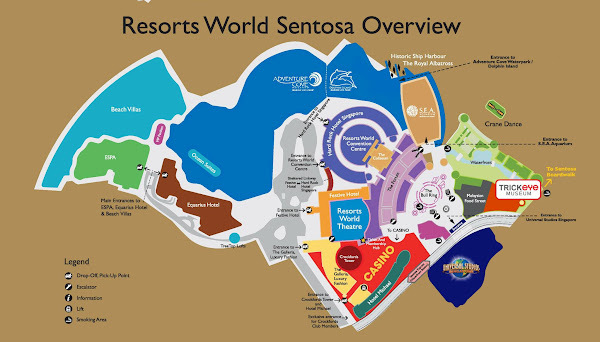 several days after the Trick Eye Museum had opened at Resorts World Sentosa. The entrance to the museum has 2 paintings which you can pose with (admission fee not required). As for the exhibits in the museum, I’ll start off with this picture in which it appears as if you’re a kid being cradled. Alternatively, you can become a giant baby’s plaything! Fans of superheroes and cartoon characters will probably enjoy it here as you can have your picture taken with them. Here’s one where you can get some famous personalities like Beckham and Bruce Lee (and even Spiderman!) to kowtow to you. Kungfu Panda – Now this is gross! You’ll never think of chocolate ice-cream in the same way again! This scene with a flying house has a character who looks like Russell, that little boy scout from the movie “Up”. You can pose and become the pupils in E.T.’s eyes, which I thought was a little weird, but we took a photo anyway just for the fun of it. Charlie Chaplin – I felt the illusion didn’t quite work as you can see the door in the wall which leads to the next room of 3D paintings. Here I am trying to stop a busload of foreign dignitaries! Experience life under the sea as a mermaid! What do you think of this dragon? Having “fun” with the Merlion – I should have brought an umbrella! Hanging around and enjoying the skyline – I thought the shadows kinda spoiled the visual effect. Meerkats – again the spotlights cast shadows onto the picture. This painting with the giraffe is one of my favourites but positioning yourself for the photo was a bit challenging! Ohh…I absolutly adored this picture of the penguins! This basketball court is created based on concept of the Ames room. I’m not sure what happened but I guess this guy needed some help to remove a tooth? Verdict: The entire museum is divided into multiple rooms with the clever use of wall partitions and you’ll need to get to the next room by opening a door. Do note that you won’t be able to return to the previous room as the door only has a handle on one side of it. This could result in overcrowding at a particular room if many people waiting for their turn to take pictures with the paintings. Be careful when opening the doors as there could be someone standing behind it! Gosh…I’ve never opened/closed so many doors in a single day! I felt the lighting ruined quite a number of the shots as the spotlights either cast shadows or had reflections in the pictures. The museum doesn’t encourage the usage of your camera flash in order for the pictures to turn out nice and thus I didn’t use any. However, the spotlights either caused parts of the picture to be overexposed, some created reflections or shadows onto the paintings, and some caused your face to be overexposed. If you use your camera flash, you’d probably create reflections of the flash in the photo too! I only had 2 favourites out of the entire collection and they were the one with the giraffe and the painting with the penguins. Overall, it’s a good rainy day activity, especially if you enjoy posing for photos. However, it’s best to go on a weekday to avoid the crowds and other people getting into your pictures! Check their website for further promotions.